Brianne and Mike had a rainy wedding in October. They did not care one bit that it was raining out either. They were so relaxed, happy, and just wanted to have fun! They both got ready at the Foundry Suites in Buffalo. Ceremony and reception were also at the Foundry. We love when brides and grooms get ready there. The suites have huge windows and so much natural light for portraits. This couple had a ceremony and reception that went back to back so we did first look photos with them. They had their first look inside the Foundry. The wedding party joined right after and we all headed to Silo City Riverworks area. The bonus here, was everyone could take cover under one of the buildings and we could call them out for photos. We brought a bunch of clear umbrellas for this wedding. 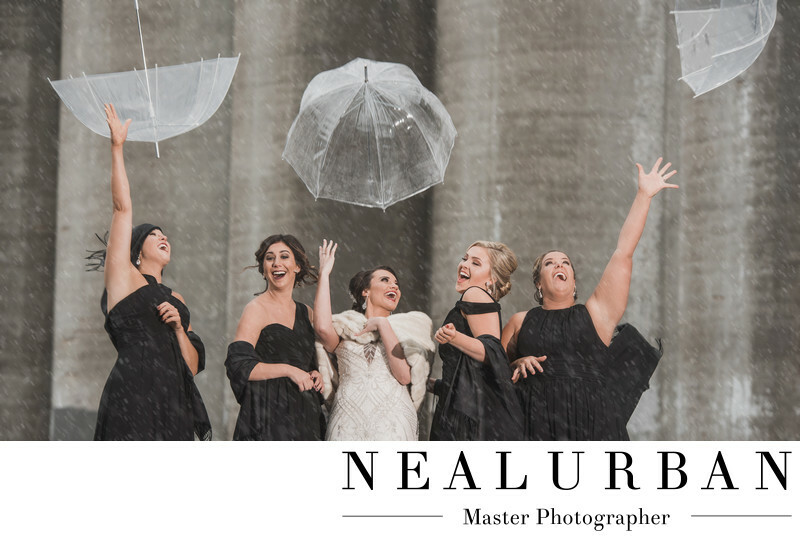 All of the bridesmaids were just as outgoing as the bride and wanted really fun photos. Our idea was to have them throw the umbrellas in the air. This shot was on the first take! The bridesmaids and bride did amazing! Their reaction was priceless. Nobody really knew where the umbrellas would fall. Just hoping they went behind them! To be safe, we only had 3 ladies hold them too. They covered everyone until it was time to throw! This was just the beginning of the whole wedding portrait session. There were laughs the entire time. We did have to use extra lighting for the portrait session. It was a bit of a dark and gloomy day and we wanted to help brighten it up a bit. We had to cover them with plastic bags to protect them from the rain. As we were swapping out the groups for photos, we were doing the same thing with the lighting gear. Luckily, it all worked out perfectly. The ceremony back at the Foundry was just as easy going! Brianne and Mike were originally having the ceremony in the courtyard, but the rain was really coming down. They had no problem moving it right into the reception area!Then everyone got up and mingled for cocktail hour! We had to much fun photographing this lovely couple and all of their family and friends. Location: 359 Ganson St.Buffalo, NY 14203.